Superstudio, the radical architectural and design practice founded in Florence in 1966, participated in several exhibitions and events. One of these was the S-Space Mondial festival in Florence in 1971. 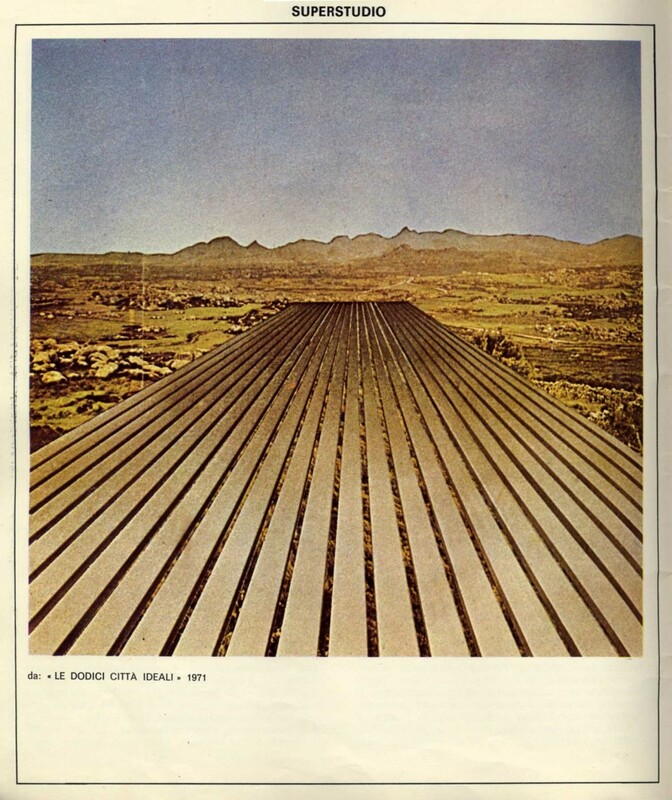 The Library holds the catalogue to this event, entitled ‘S-Space presents: vita, morte e miracoli dell’architettura’ (Life, death and miracles of architecture), catalog festival n. 1, Nov. 9-11/1971, Space Electronic, Firenze, co-produced by 9999 and Superstudio. 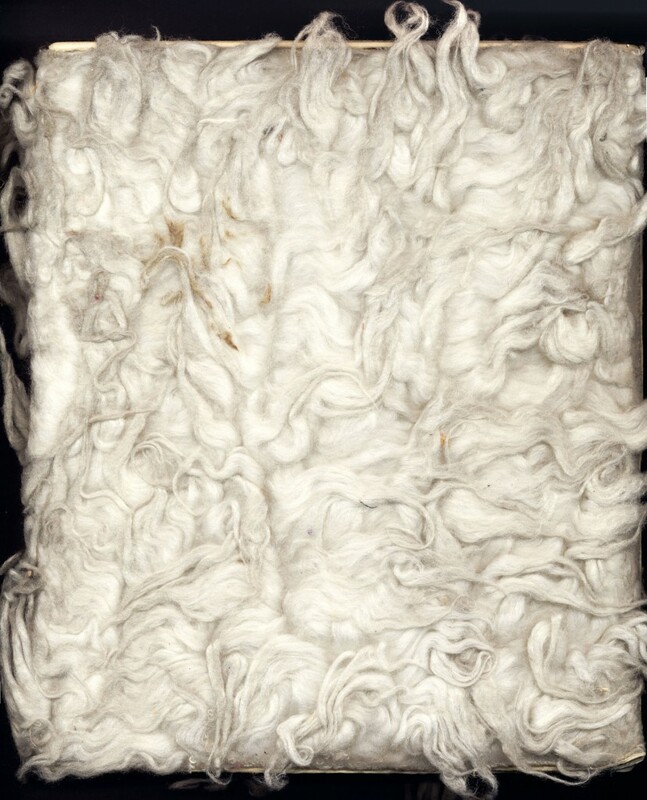 The catalogue is radical in design and bound in natural sheepskin, now a bit discoloured and grey, but it must be one of most tactile books in the collection. Both the cover and page design are by 9999. The catalogue describes S-Space as a ‘non-physical center of production, elaboration and transmission of ideas, processes, events, apparitions, prophecies, memories, situations, existences. S-Space is a catalogue experience for conceptual, expanded, impossible, imaginary and reflected architecture’. Several groups and individuals participated in this multimedia event. Writing about it, Bruce Haggart describes how 9999’s disco ‘Space Electronic’ (they ran a disco as they couldn’t get work as architects) became for a week the Separate School for Expanded Conceptual Architecture. The event included an environmental fantasy with an ‘ocean’ constructed in the basement, plus plants and vegetables. Renato Ranaldi played his fart machine involving wooden wedges and balloons; Street Farm presented Street Scarecrows, meant to scare from the street things that menace people like cars. The group UFO built a doric portico of plastic foam; Ziggurat presented tents of concrete; Marc Balet showed a movie ‘Dream House’. 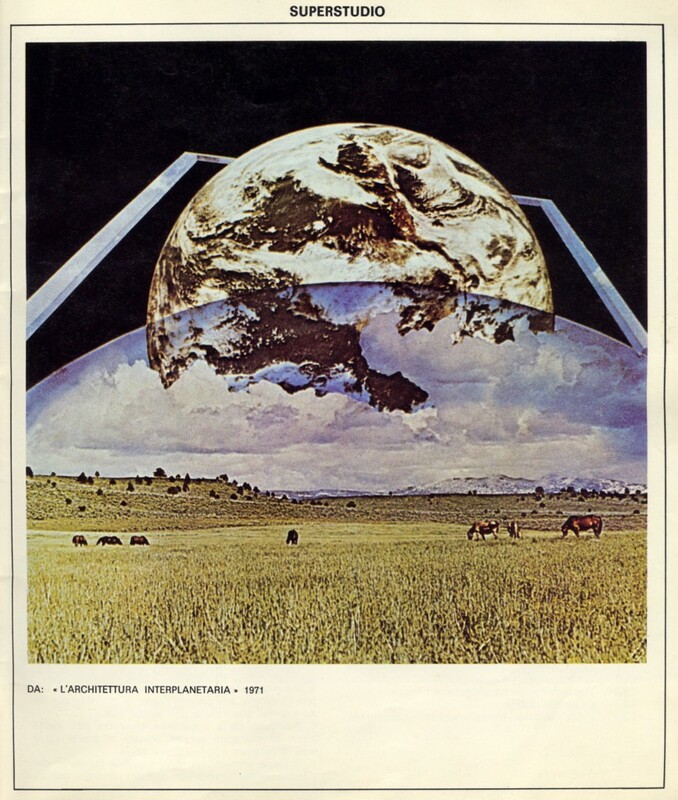 Superstudio’s project Twelve Ideal Cities was very different from the work by groups like Street Farm and their eco-anarchy. Superstudio presented a systematic, technologically advanced concept of the environment, the schemes expressed through grids or geometries. 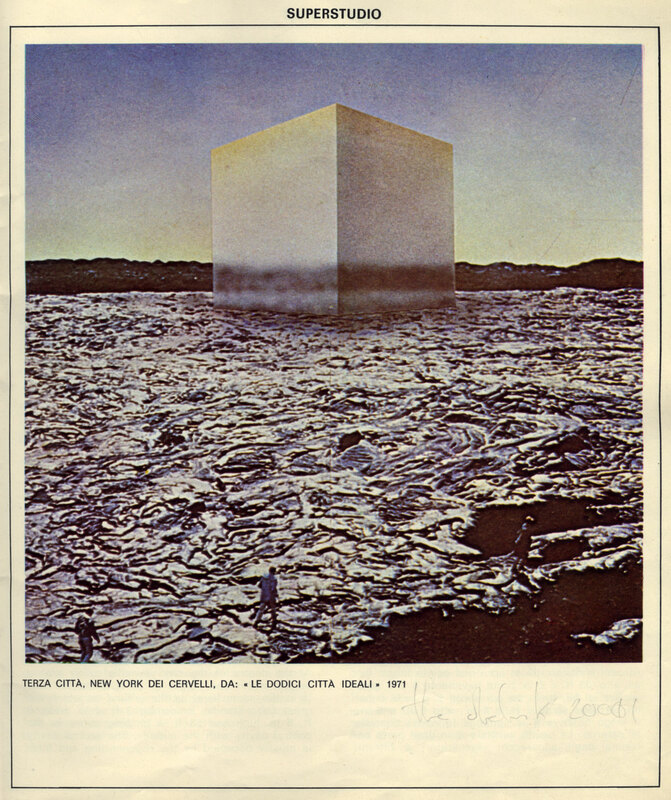 One of the schemes, titled ‘Third city: New York of Brains’, was a plan to rebuild the city in a cube covered in quartz tiles: the covering condenses light onto a photosensitive layer behind, transforming it into energy for the city. Haggart concludes: ‘Architecture has never been a popular art … Its legacy is one of palaces, cathedrals, fortifications, office blocks: commemorations to those with power and wealth. … Better we become entertainers, jesters, clowns, trapeze artists, alchemists, singing songs of the new age’ .. Then will the grass have time to grow under our feet and moss gather on our stones. Not planning men, but stirring their imagination.’ (Bruce Haggart, ‘Italian trip’, Architectural Design, April 1972, p.202).